If you’ve ever wondered how you could turn your passion for all things beauty into a career, then wonder no more. A role as a make-up artist could be the perfect career for you. Combining passion and skills, this career will open up numerous pathways. From lashes to brows, skin biology to cosmetics, the world of make-up and beauty is your oyster. 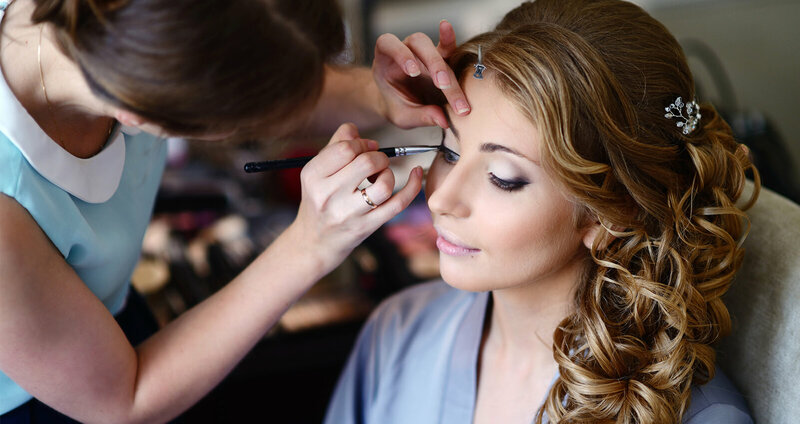 Brides, theatres, cosmetic companies, salons, fashion brands, TV shows and even celebrities all need a professional make-up artist. So, could that person be you? As they say, there’s no place like home. And it’s very much the case when it comes to experimenting with cosmetics. Playing around with different products on both yourself and friends can be a good way to try different looks and hone your skills. Working at a make-up sales counter also provides good experience and exposure to the beauty industry. If you’re wanting to gain experience in a beauty salon or specialist make-up business directly, you’ll likely have to shadow experienced staff. You may be able to practice on voluntary models too. However, to build up your own clientele and potentially your own business, studying and getting qualified is the way to go. Professional make-up artist, Amy Kenny, has worked in the industry for 15 years. She knows how combining qualifications and experience leads to success. “[When you begin], don't rule out working on a cosmetic counter. It may not be for everyone, but it's a great way to build your skills with different skin tones and skin types, and also helps you increase your application speed. Assisting established make-up artists is a good way to learn about the industry and understand job etiquette,” she says. Photography make-up artist, Amelia Webb, echoes this. What formal training and courses should I do? While there are no specific qualifications required to work as a make-up artist in Australia, there’s plenty of career benefits that come with training - especially if it's nationally recognised. “In Australia, beauty therapists with a diploma qualification are qualified in all areas of beauty therapy and recognised worldwide for their skills and friendly client care,” says Jocelyn Petroni, a multi-disciplined beauty salon business owner. Completing a nationally recognised Australian qualification will give you an advantage over other applicants for beauty industry jobs. Much like the latest make-up looks, a qualification will make you shine. A Diploma of Beauty Therapy provides you with the skills to perform a full range of beauty therapies, inclusive of waxing, facials, microdermabrasion and manicures. Pictured: Diploma of Beauty Therapy kit. Each subject will cover specific beauty services in depth and be accompanied by a professional beauty kit with tools and products for you to use and keep. During the make-up subjects of your beauty therapy course, you’ll receive a professional make-up and facial kit, enabling you to practise your new-found skills as you go. Skills you’ll learn include designing and applying different styles of make-up, correctly cleaning your work area, applying false eyelashes and customer aftercare. A Certificate IV in Beauty Therapy will provide you with the same skills, although some subjects are covered in more depth. Like the Diploma, students who undertake the Certificate will receive their own professional beauty kit to use throughout and after the course. Both courses also cover the importance of understanding skin biology and skin health - something that is necessary to become a make-up artist. These courses will qualify you to enter the beauty industry armed with the skills and knowledge necessary to become a success. "Beauty therapy subjects are so diverse, which is a perfect opportunity to establish [if you like] the "artistic", "holistic" or "skin science" components you will cover. Be sure that the art of drawing or creating resonates with you," advises internationally-recognised lash and brow artist, Amy Jean. Specialist makeup courses can also help you hone your skills in a specific area once you’ve learned where your strengths and artistic inclination lies. "What I love about what I do is the variety," says Anna Field, Founder of The Paddington Beauty Room. "I spend time supporting and helping my colleagues and my absolute favourite thing to do is interact with clients, giving them advice, tips and product suggestions." But you should be prepared to be adaptable. Depending on the role that you’re working in, it’s likely that each day will be varied and busy. Hours may fluctuate between long and short, depending on client demands, and weekend work will be inevitable if you’re making up brides or running your own business. How do I build up a make-up portfolio? As with any career, building a make-up portfolio takes time and dedication, but taking proactive measures helps too. Marketing yourself in a way that’s both appealing and accessible is a good way to help people find you, as is considering putting yourself out there on apps such as Glamazon and My Style Squad. Where possible it’s also useful to put your portfolio online on relevant beauty industry sites or even take the traditional route of advertising in local newspapers or magazines. Another idea is to advertise your services on supermarket notice boards, or approach hair salons to see if you can leave some business cards on their front desks. Thinking creatively and outside the box will help build your portfolio quicker and subsequently, boost both your reputation and earning capacity. “Make-up is an incredible and exciting industry to be in. If you are as passionate about it as I am you will really love what you do and it won’t feel like it’s your job”, says Amelia. "PRACTISE. Look for bosses who develop staff. If you don’t like people don’t do it. If you love making people feel good about themselves then this is an industry for you," adds Anna. There’s no time like the present to embrace all that glitters and is gold – quite literally! Download your free Beauty course guide via the form below.